From October 16, 2017 - October 19, 2017, Prof. Gorelik Vladimir, the chief researcher of Raman scattering laboratory at the P.N. Lebedev Physical Institute of the Russian Academy of Sciences, was invited to visit our Institute together with his Chinese PhD student, Ms. BI Dongxue. During the visit, Prof. Gorelik Vladimir gave a lecture entitled "Optical properties of mesoporous photonic crystals, filled with dielectrics, ferroelectrics or pizeoelectrics", and more than a dozen researchers have listened to the lecture. In addition, Prof. Gorelik Vladimir met with the senior Prof. ZHANG Lide, and visited some laboratories. 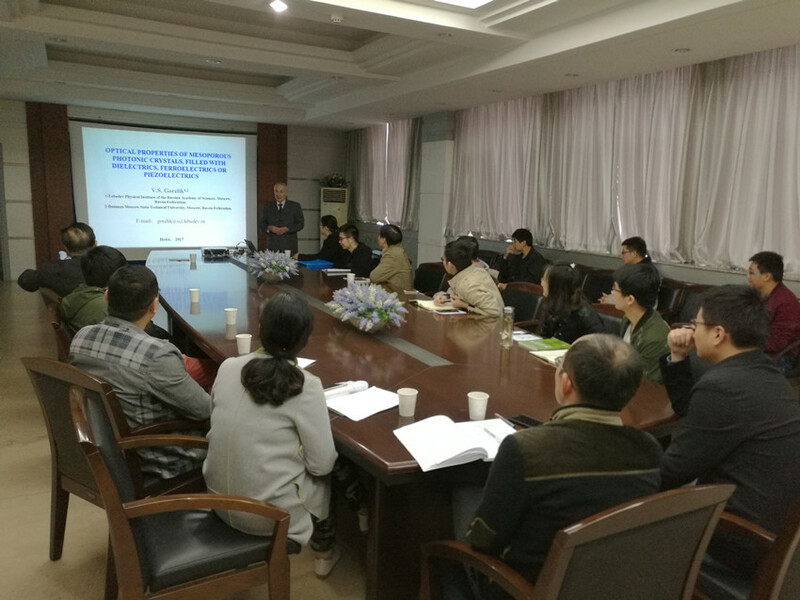 Several researchers of Prof. FEI Guangtao's research group in our institute showed Prof. Gorelik Vladimir recent research results, and some of them have attracted intense interest from Prof. Gorelik Vladimir. The two sides have discussed the future collaborative research issues. Prof. Gorelik Vladimir and Prof. FEI Guangtao have conducted the cooperative study on the optical properties of porous alumina photonic crystals more than one year, and have achieved good results. Up till now, the two sides have jointly published 2 papers in the international journal and 2 papers at the international conference. Prof. Gorelik Vladimir is the chief researcher of Raman scattering laboratory at the P.N. Lebedev Physical Institute of the Russian Academy of Sciences, and Professor of the Department of Physics of Bauman Moscow State Technical University. He is a member of the physics division of the Russian academy of natural sciences. Prof. Gorelik has studied the optical properties of materials for a long time. He has an in-depth understanding of the characteristic and application of photonic crystals, Raman scattering, laser radiation and its interaction with condensed matter, and lattice dynamics theory. He has published more than 400 papers on optics, including 268 SCI papers and about 90 papers on photonic crystals, and a series of monographs, including "Introduction to the crystal Raman spectroscopy". He won the "veteran labor” medal issued by the Russian government in 1990, the “In Commemoration of the 850th Anniversary of Moscow” medal in 1997, the “honorary award of the Russian academy of sciences” in 1999, and the “Honored Scientist of the Russian Federation” in 2004.